Welcome to Down On The Street, where we admire old vehicles found on the streets of the Island That Rust Forgot: Alameda, California. Today we're going to look at the second-oldest car in this series. Check out the headroom in this thing! Four basketball players in top hats could carpool in this machine (five if the backseat passengers are extra skinny), although the 20-horsepower flathead four under the hood would make their commute a leisurely one. Back in 1924, the price tag on one of these Fords was $580, which translates to about $7,200 in today's dollars. Would you buy the 2009 equivalent of the Model T for that kind of money? 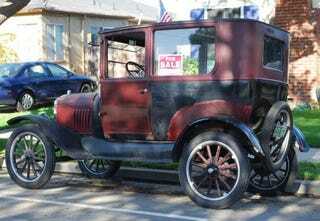 This car shares an owner with the 1919 Model T Touring, and both are used to run errands around town. Closing in on a century and still putting on miles! And there's the 1971 C10 Custom Deluxe, right across the street. The '73 Corvette lives just around the corner. Notice all the American flags on the houses in this neighborhood; it's not a holiday, just business as usual in the Navy-retiree-heavy area near the (now-closed) Alameda Naval Air Station.